Hi there, I am looking for some ideas for design or plants/shrubs for corner in a small back garden which gets no direct sun throughout the year. It is a very shady area where grass wont even grow (despite numerous attempts at sowing grass etc). So at the moment it does not look great, patches of grass and soil. It really needs a revamp with either a bed of plants or shrubs that don't require much light or good soil, paved slabs just to sit potted plants on, wall creepers, bamboo, build a BBQ... i really can't figure out what the best solution is. Any advice on plants, design or other ideas would be much appreciated. The area is approx 1.5 metres by 1.5 metres. Attached is a photo of the corner itself. You could put invest in a good ceramic or concrete bird bath and surround it with attractive large pots of ferns, hostas, ivies and other shade lovers. Include some evergreens for winter interest and use pots of crocus etc for early colour. Ivy could be encouraged to grow op the wall, too. From the look of the moss on the wall, many ferns will do well there. Native Hart's Tongue fern will, certainly. Use gravel to cover the soil but still allow rain water to drain away. I'd build a little quarter circle, stone wall, about a foot high, fill it with top soil and either rocks or stumps of wood and plant it totally with ferns, making a lovely little fern dell. There are loads of different types of ferns these days; one species is purple and grows to a metre across. Another idea is to build the same wall but make inside into a currently fashionable fairy garden. 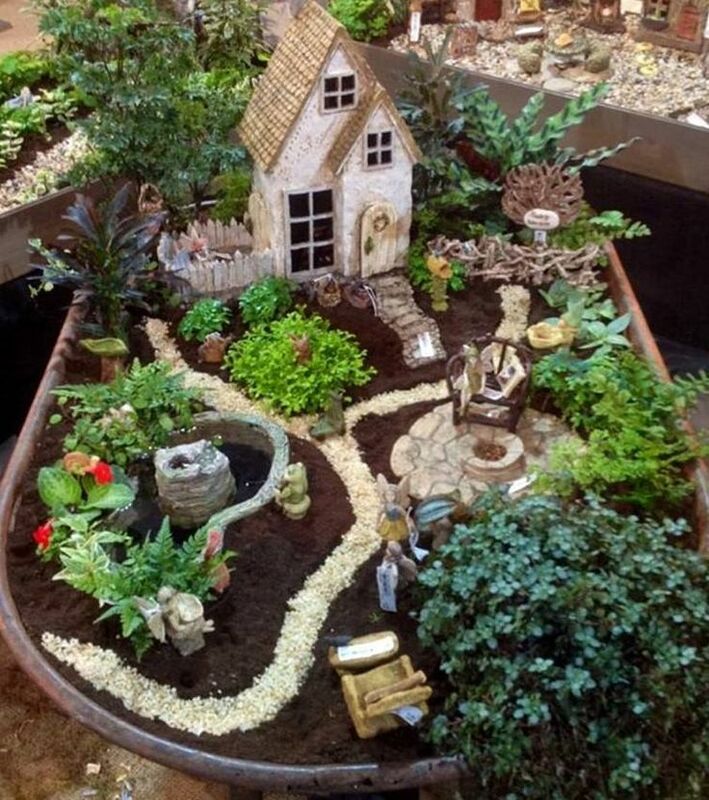 Fairy gardens are all the rage now. I had a similar problem in part of my new garden. A shady spot that gets early morning and late afternoon sun (in Summer) and has a couple of big tree stumps in it that would be difficult to remove. I solved it with kindredspirit's idea. I think it works very well. Just one thought, I might put a layer of stone around the back so the soil doesn't touch the walls. The photo was taken early last month at about 9 AM. By 11 it is in the shade. The ferns have all grown a lot since then. Fi Red. paint those blocks white. It will reflect light and help a little bit. build a little man/woman shed for yourself where you can meditate. Thanks for all the interesting responses..